You need to create an event handler to make your functions callable from the UI. Here is an example for a function and an event handler. The event handler foo_eventhandler calls the function foo which displays a message box with “Hello World from Excel”. 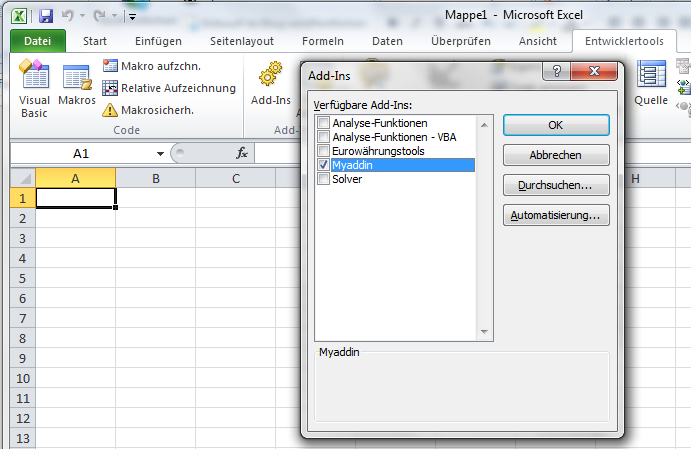 Save your Excel as Excel Addin (.xlam) to your C:\Users\YOURNAME\AppData\Roaming\Microsoft\Addins directory. You can save it wherever you want, but the predefined addins directory might be good idea. 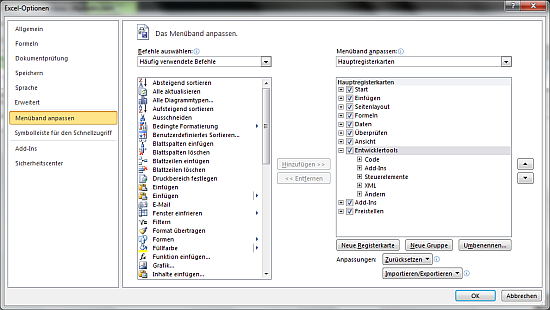 <button id="customButton1" label="Say Hello" size="large"
Start Excel from the program menu. Go to File > Options > Security Center > Settings > Secure Locations > Add Location, and add your addins directory e.g. 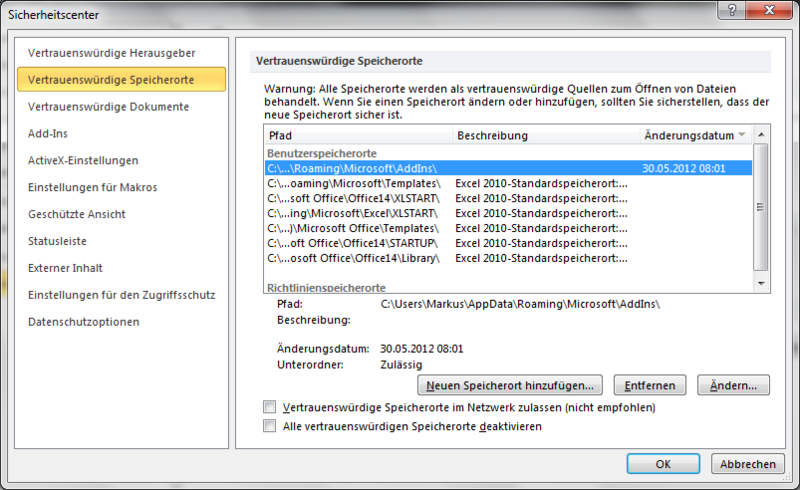 C:\Users\YOURNAME\AppData\Roaming\Microsoft\Addins as secure directory to load stuff from. Close Excel. There are many icons available you can use for your addins. For example download the icon gallery addin from http://www.accessribbon.de/index.php?Downloads:24 . To change the icon on button modify the imageMso property in your xml file. “Cannot run the macro ‘foo_eventhandler’. The macro may not be available in this workbook or all macros may be disabled.”. I’ve obviously enabled all the macros. Thank you so much. I did it. I found your blog as very useful. I tried reusing with my excel sheet. Unfortunately, I am unable to locate the event handler button. Under the step where you check your newly created add in, it calls it “Myaddin”. Where is that name pulled from? That string is not in your provided code, but you don’t specify what you called your filename. I have been searching for this answer online a few times the last week and can’t seem to find a way to change that display name on an existing Add in (written by my predecessor). Have saved the .xlam and created the customui and works great if I open excel but if excel is opened via another application the custom ribbon tab is missing. How to force all excel instances to open the customui? Hi, you can create a function that activates the add in with a timer. If you double-click on the file, it is in some cases loaded before the addin activates. 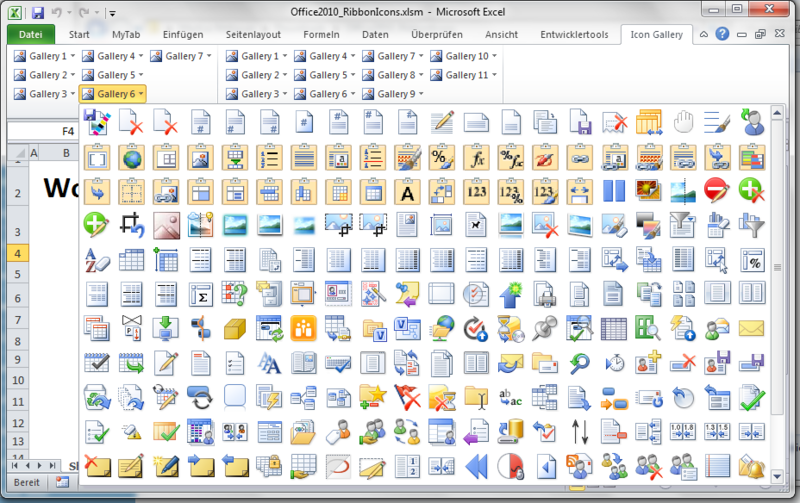 Finding the best image suited for a custom control is not that easy, as there are about 4,000 unique icons in Office 2013. This free Excel VBA Add-in uses the Ribbon Commander framework to display dynamically built-in imageMSO icons or imported images in Excel’s Ribbon (in buttons or gallery items). What you see, is what you get in your Ribbon ! The imageMSO or any image list can be filtered using with a description keyword search or can be browsed sequentially in a ribbon gallery. The descriptions of any buttons clicked are saved in a list, which can be exported for use with the Custom UI editor or re-imported to the Add-in for viewing. Thank you very much. It is so helpful. I don’t suppose that there is anywhere that can tell me how to do this without the handy “Custom UI Editor?” I’m not able to download this at work. Sure, the generated XML can be written by hand. The schema is public available. However, it is more error prone if you have to write it by your own. Thanks a lot for this post. Very informative. Thank you for the detailed instructions. Do you know how to have the newly created ribbon appear at the end (far right) of the existing ribbons? My new ribbons are appearing on the far left. Thanks for this post. It worked like a charm!